Is the United States Committed to Warhead Dismantlement? The National Nuclear Security Administration (NNSA) has just announced that the Pantex Plant accomplished 126 percent of its planned dismantlements for FY10. The problem with claims like this is that NNSA never states their original goal. Doing more than what was planned is always good. The question is whether the original objective was aggressive enough. For NNSA, this kind of ambiguity with dismantlement goals is fairly common. At the 2007 Non-Proliferation Treaty Review Conference, U.S. Special Representative Christopher Ford boasted that the U.S. had “achieved a remarkable 146 percent increase” in dismantlement. Until recently, there was no way to assess these assertions because NNSA had not disclosed its dismantlement rates. This changed in May when, facing international pressure, the Obama administration made U.S. nuclear stockpile numbers and dismantlement rates public. With this information now available, we know that the 146 percent increase in 2007 was an increase of fewer than 300 warheads from 2006, still far below historic dismantlement rates. In the 1990s, the U.S. dismantled more than a thousand warheads per year. After NNSA began refurbishments through Life Extension Programs, rates dropped to 200 to 300 from FY99 through FY06. In its press release, NNSA said that the work at Pantex has been part of “President Obama’s unprecedented nuclear security agenda.” However, one has to ask whether dismantlement will play a significant part. Today, officials at Y-12 acknowledged that dismantlement of uranium secondaries would be lower this year than in the past because they are dismantling more complicated systems. Some quick background: Pantex’s dismantlement rates are established in a highly classified document called the Production and Planning Directive (P&PD). Published annually, the P&PD is based on a broader policy document signed by the President called the Nuclear Weapons Stockpile Memorandum. Combining policy decisions from Defense and Energy Departments, the P&PD dictates requirements for NNSA production facilities ten years into the future. Looking into the near future, prospects for making dismantlement a bigger priority are bleak. In the FY11 budget request, dismantlement is less than a third of the money spent at Pantex for Directed Stockpile Work and slightly more than 10% of the overall budget at Pantex. Over the next five years (if not longer), that is unlikely to change. Not surprisingly, the result of this minimal funding over this time is low dismantlement rates. According to the FY11 Stockpile Stewardship and Management Plan, NNSA will finish dismantling its current backlog of retired warheads by 2022. With an estimated backlog of 4000 retired warheads, Pantex will be dismantling an average of 375 warheads per year. This is roughly half the number of warheads dismantled in 2007 or 2008 and far below what Pantex dismantled in the 1990s. Short of building new dismantlement facilities (which carries with it a whole other set of problems), Congress or the Obama administration will need to step in to prioritize reducing the nuclear threat over fiddling around with the U.S. nuclear arsenal. Some of that work has already started. Earlier this year, Senator Feingold (D-WI) and Congressman Markey sent a letter encouraging President Obama to make dismantlement a greater priority. In the letter, they say “NNSA informed our offices that without building any new facilities, increased funding alone could help increase the dismantlement rate by up to 50%.” Estimates vary on the total number, but it is widely acknowledged that Pantex has a number of unused bays and cells. From what I understand, a relatively small amount of money would be required to accomplish this task. To be fair, money will not solve the problem by itself and a decrease in the dismantlement budget does not automatically mean less dismantlement. 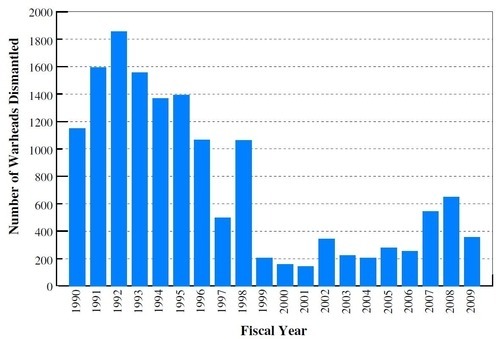 The chart below shows the total funding for Pantex over the past five years, the amount that goes to dismantlement and disposition, and the number of warheads dismantled for those years. For comparison, the last line shows the budget for direct stockpile work, which includes funding for Life Extension Programs and surveillance. At least over the past 5 years, a decrease in the dismantlement budget did not automatically mean less dismantlement. Note: This plot shows the number of warheads dismantled annually starting in 1990, based on two sources. The significant drop in dismantlement rates in 1999 most likely reflects Pantex’s involvement in completing the first production units for the W87 Life Extension Program. The increase in dismantlement rates in 2007 and 2008 are most likely the result of a one-time budget increase in FY07 for “special tools” that helped to “maximize capacity usage at Pantex” (Volume 1, Page 89, FY07 DOE Budget Request). Why is dismantlement important? Some have argued that dismantlement is simply a symbolic gesture with little importance. While it is true that part of the significance of dismantlement is symbolic, it is certainly not unimportant. Demonstrating a commitment to dismantlement will help strengthen international nonproliferation efforts. In a Carnegie Endowment Report titled Are Nuclear Bargains Attainable, Deepti Choubey says that members of the NonProliferation Treaty still identify irreversible reductions (i.e. dismantling warheads) as a key way to “demonstrate seriousness about disarmament.” Additionally, it is likely that future nuclear reduction treaties will include dismantlement and transparency commitments. In preparation, the United States should pay more attention to these issues now. After being criticized for not making dismantlement a priority earlier this year, NNSA has made a concerted effort to publicize the work at Pantex. Last week it made a big deal out of beginning dismantlement of the B53 warhead and this week it is saying that it exceeded its goals for FY10. At the same time, NNSA is actually decreasing funding for dismantlement. To truly demonstrate a commitment to dismantlement, NNSA needs to combine its publicity with an actual increase in work. Also, more transparency would be nice.